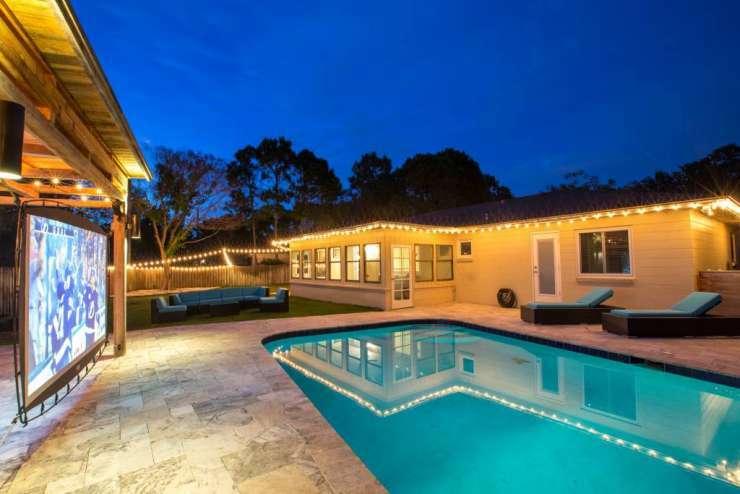 This mid-century modern home is located on 1/4 acre of land in the heart of Original Carrollwood. Move right in to this updated POOL home featuring an open floorplan w/ a large kitchen that boasts granite counters, stainless appliances, tile backsplash, pantry, & breakfast bar that overlooks the dinette & spacious family room. The laundry room is located off the kitchen & has a built-in sink, second fridge, shelving, & room for a side by side W/D. The front room is being used as a seating area & can be used as an office, media/game room, or formal dining & living room…the options are endless! The master suite has 2 closets, room for a king size bed, & attached master bath w/ dual sinks & walk-in shower. The secondary bedrooms are spacious & the secondary bath is completely updated. There is a linen closet & a coat closet for additional storage, storage shed & custom kayak rack in the back yard, & storage room located off the carport. The Florida room overlooks the spacious back yard & sparkling pool and can be used as a den/office, game, or media room. Enjoy grilling & entertaining in your huge backyard that is fully fenced on all sides & updated with new travertine tile, huge covered pergola that is perfect for lounging or dining alfresco, lush landscaping, irrigation system, & more! Enjoy everything Original Carrollwood has to offer: tennis courts, playground, park, dog park, ball & soccer fields, rec center, & private beach with 210 acre ski lake, access for boating, kayaking, fishing, swimming & more!